Boss have taken their classic distortion pedal and applied in excess of 35 years of pedal design excellence to it, to create the Special Edition Boss DS-1X Distortion Pedal. Utilising their advancing technologies, the pedal offers a new level of performance and tonality. The next generation sound, feel and tonal response will add superb drive and power to your performance. 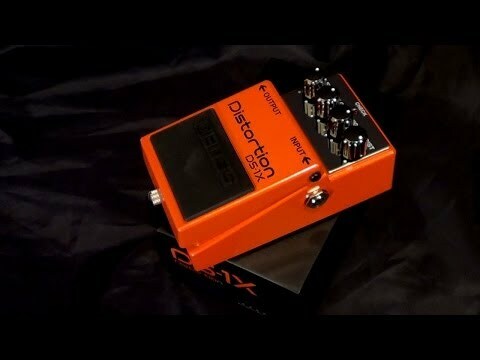 The real time performance of the Boss DS-1X distorion pedal delivers a high-clarity distortion sound without muddyness or that undisirable boomy sound. All you get is tight, crisp tones on the low strings to fat, singing tones on the highest notes. Even with the highest gain settings the Boss DS-1X distortion pedal has an impressively low noise floor meaning your sound engineer will thank you! But one area it certainly doesn't shy away from is the design, the striking looks will make this visable to you even on the darkest of stages. Power in a pedal is the tagline here and the DS-1SX distortion pedal harnesses Boss' innovative multi-dimensional processing, realized with proprietary technology and custom DSP. Add some intelligent distortion to your setup with the DS-1X distortion pedal.